If any of James Stephens' books might be thought to have need of an Introduction it would be the delightful story that is called "Mary, Mary" on one side of the Atlantic Ocean and "The Charwoman's Daughter" on the other. It was written in 1910, when the author was known as the poet of "Insurrections" and the writer of a few of the mordant studies that belong to a later book, "Here Are Ladies." In 1911 four people came together to establish "The Irish Review." They were David Houston, Thomas MacDonagh, James Stephens and the present writer. James Stephens mentioned that he could hand over some stuff for publication. The "stuff" was the book in hand. It came out as a serial in the second number with the title "Mary, A Story," ran for a twelvemonth and did much to make the fortune (if a review that perished after a career of four years ever had its fortune made) of "The Irish Review." 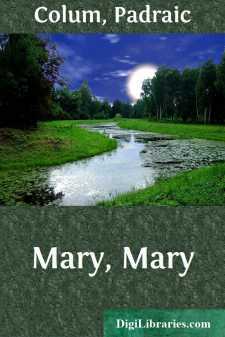 From the publication of its first chapters the appeal of "Mary" was felt in two or three countries. Mary Makebelieve was not just a fictional heroine—she was Cinderella and Snow-white and all the maidens of tradition for whom the name of heroine is big and burthensome. With the first words of the story James Stephens put us into the attitude of listeners to the household tale of folk-lore. "Mary, Mary" is the simplest of stories: a girl sees this and that, meets a Great Creature who makes advances to her, is humiliated, finds a young champion and comes into her fortune—that is all there is to it as a story. But is it not enough to go with Mary to Stephens' Green and watch the young ducks "pick up nothing with the greatest eagerness and swallow it with the greatest delight," and after that to notice that the ring priced One Hundred Pounds has been taken from the Jewellers' window, and then stand outside the theatre with her and her mother and make up with them the story of the plays from the pictures on the posters?—plays of mystery and imagination they must have surely been. Then, of course, there is always Mary's mother; and Mrs. Makebelieve, with her beaked nose, and her eyes like pools of ink, and her eagle-flights of speech would give a backbone to any story. Mrs. Makebelieve has and holds all the privileges of the poor and the lonely. Moreover, she is the eternal Charwoman. "She could not remain for any length of time in peoples' employment without being troubled by the fact that these folk had houses of their own and were actually employing her in a menial capacity." Mrs. Makebelieve is, I think, a typical figure. She is the incarnation of the pride and liveliness and imaginative exuberance that permit the poor to live. How poor are Mary and Mrs. Makebelieve? We know their lack by the measure of their desire. Mrs. Makebelieve, always generous, would have paid her servants Ten Shillings per Week each, and their Board. And we know that she had often observed desolate people dragging themselves through the streets, standing to glare through the windows of bakeries and confectioners' shops, with little children in some of their arms, and that thinking of such things every morsel she ate would have choked her were it not for her own hunger. By our being brought to desire what Mary and her mother desired we come to know the things they lacked.